Single drape cm 133x200, water-repellent, with adhesive triangular opening cm 11x10, no-panic window and Velcro tube holder. This single drape has a triangular opening, with an adhesive layer that allows it to be fixed to the patient's chin. A mouldable aluminium band positioned at the top of the triangular opening allows it to be positioned securely on the patient's nose. 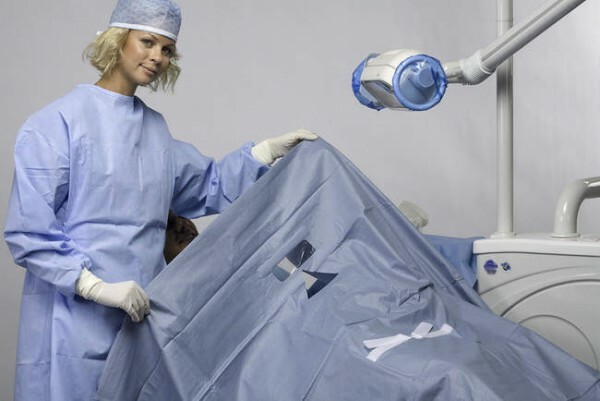 To protect the patient's eyes from any accidental splashes or wounds, the drape has a protective window in transparent material, which also allows easy and immediate communication between patient and operator to prevent any unpleasant panic situations.